When we last headed for the sand dunes, we knew we wanted some traction royalty, so we called AMS about the Sand King tires. 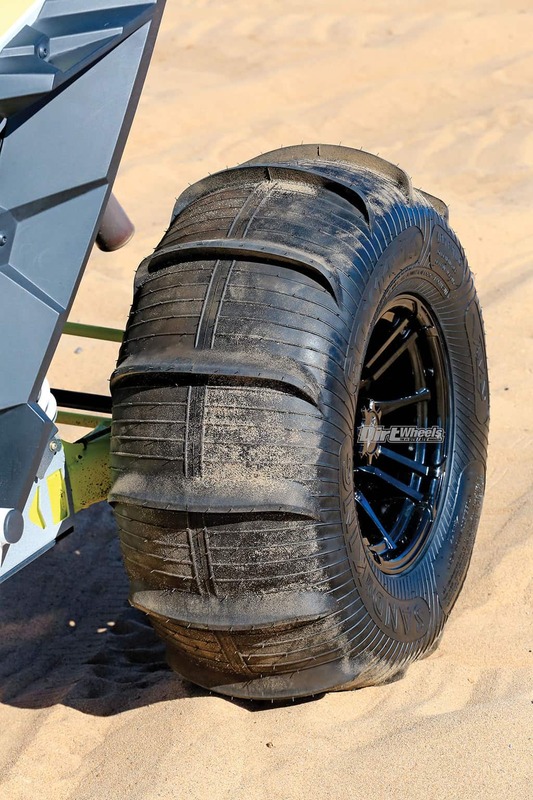 Some sand tires are buffed before paddles are vulcanized on, but the 14-paddle Sand King rear is molded like a normal four-ply tire with a large-volume, high-flotation 30×14 carcass. The Sand King front is a traditional-appearing, high-flotation, high-volume, smooth tire with a solid center rib flanked by two segmented ribs. Both sets of tires were mounted on AMS Roll’N 108 rims in 14×10 and 14×8 sizes. 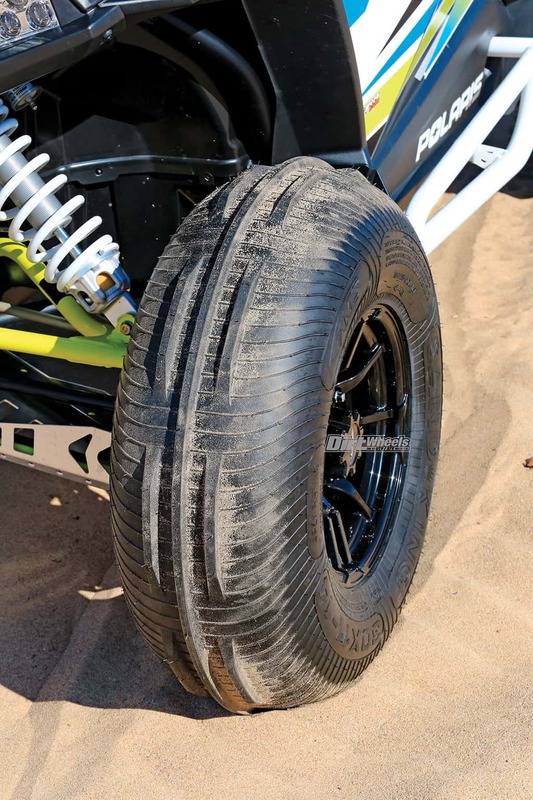 Like the rear paddle, the Sand King front is designed like many tires with cut treads. The segmented side ribs look like they are cut down from solid ribs, but the molded-in web of tiny ribs are undisturbed, so you can see that the tread was molded this way. The 30×14-14 AMS Sand King $198.95 rear tire and $149.95 front 30×11-14 tire make a mean-looking sand combo. In addition to the many 1-inch paddles on the rear tire, there are a web of tiny ribs molded into the rear tire that look cool but we presume also add some carcass support. We worried that all the paddles would provide too much traction and pull the motor down on our Polaris XP 1000, but they didn’t. Perhaps that is a function of the paddles being only an inch tall. The byproduct is that the ride is not overly bouncy when you do encounter firm soil. 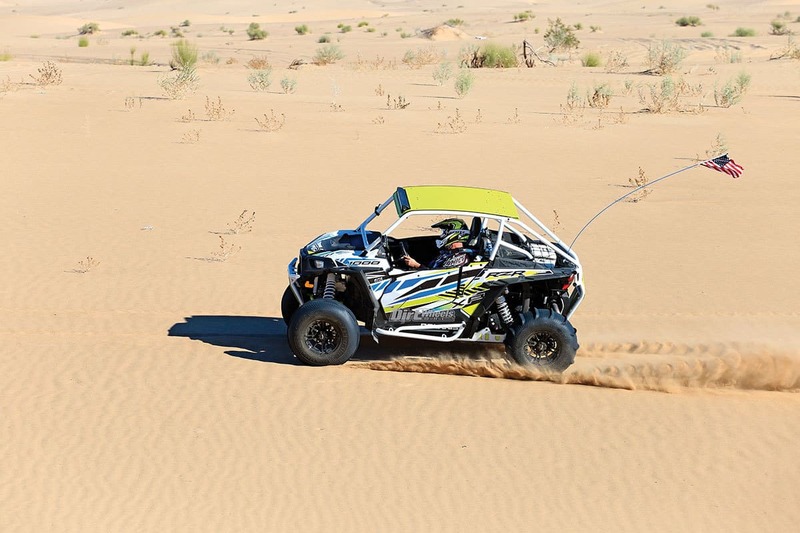 Both the 14-paddle rear and the three-rib front are over an inch taller and a full inch wider than the stock sizes, but they felt great on our XP. The tires have a lot of volume for great flotation on sand. The three-rib front with the segmented side ribs is a little unique, but the design works very well steering accurately from very low speeds. They ride smoothly on all sorts of sand, and the traction is great, but the bite is smooth. The machine doesn’t lunge when you hit the gas. It accelerates like a regular tire, but better and with more predictability. The tri-rib front has all three short ribs on the center of the tire. The middle one is an unbroken rib, but the two flanking ribs are matching segments. That leaves much of the tire smooth and rounded for flotation. The tires feel light and are extremely responsive to steering inputs from very low speeds. The rear tires also have great volume for flotation, and the size and many paddles created some interesting sounds. At times, under hard acceleration, we thought another car was passing us, but it was the sound of the tire. It wasn’t always evident, and it was fun rather than annoying. The rear will slide if you flick the car hard under throttle. Despite the straight-line drive, the XP didn’t push excessively in turns under power. The front tri-rib design grabs the sand. You wouldn’t think it would matter whether it was in AWD or not, but it did. They definitely add to the acceleration, and they throw some sand. Sand wants a bunch of sharp paddles for drive, and the Sand King rear has them in spades. The tire works in a straight line and while turning. AMS says that the Roll’N 108 wheels are matte black, but ours looked fairly glossy, and we appreciated the light and stylish look. They are not beadlocks, but we ran 9 psi in the sand with no issues at all. The center caps come with the wheels, but the stock lug nuts won’t fit. You will need aftermarket ones. AMS has them. We used hex-head lug nuts with 17mm heads. 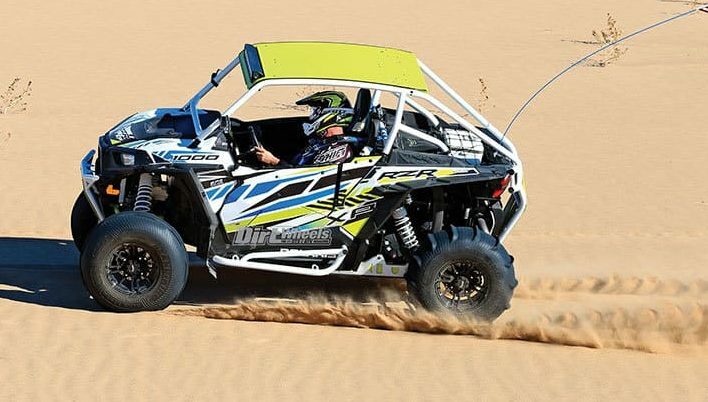 These wheels have a deeper dish than the stock wheels, so between the $116.95 rear wheels and $106.95 front wheels and the wide tires, you are making the track wider, which is a nice feeling in the dunes. Go to www.amstires.com to see the full line of AMS tires and wheels. THE NEW SEPTEMBER ISSUE IS HERE!